Adolph Lewisohn [c. 1849-1938], New York, by 1921;  by inheritance to his son Sam Adolph Lewisohn [1884-1951], New York; by inheritance to his wife, née Margaret Seligman [1895-1954], New York; bequest 1954 to NGA. Lent to Loan Exhibition of Impressionist and Post-Impressionist Paintings, The Metropolitan Museum of Art, 1921, no. 106. Loan Exhibition of Impressionist and Post-Impressionist Paintings, The Metropolitan Museum of Art, 1921, no. 106, repro. Renoir Retrospective, Nagoya City Art Museum; Hiroshima Museum of Art; Nara Prefectoral Museum of Art, 1988-1989, no. 35, repro. Obras Maestras de la National Gallery of Art de Washington, Museo Nacional de Antropología, Mexico City, 1996-1997, unnumbered catalogue, 158-159, color repro. 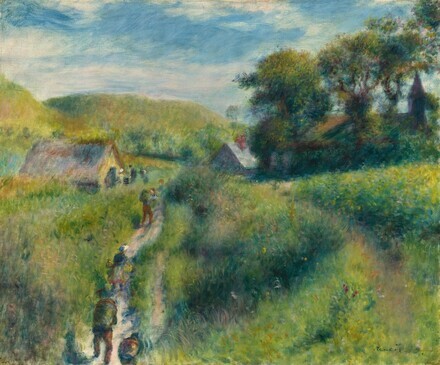 Renoir Landscapes 1865-1883, The National Gallery, London; National Gallery of Canada, Ottawa; Philadelphia Museum of Art, 2007-2008, no. 46, repro., as The Mussel Harvest. L'Atelier en Plein Air: Les Impressionnistes en Normandie: Turner, Boudin, Monet, Renoir, Gauguin, Pissarro, Morisot, Caillebotte, Signac..., Musée Jacquemart-André, Paris, 2016, no. 20, repro., as La Cueillette des moules à Berneval. Bourgeois, Stephen. The Adolphe Lewisohn Collection of Modern French Paintings and Sculptures. New York, 1928: 132, repro. Meier-Graefe, Julius. Renoir. Leipzig, 1929: repro. p. 115, no. 114. Vollard, Ambroise. Renoir: An Intimate Record. New York, 1934:245. Wilenski, R.H. French Painting. Boston, 1936:262. McBride, Henry. "The Renoirs in America: In Appreciation of the Metropolitan Museum's Exhibition," Art News 35, no. 31 (1 May 1937): repro. p. 74. Wilenski, R.H. Modern French Painters. New York, 1940: 338. Drucker, Michel. Renoir. Paris, 1944:53-54, 201, repro. pl. 54. Summary Catalogue of European Paintings and Sculpture. National Gallery of Art, Washington, 1965: 112. Fezzi, Elda. L'opera completa di Renoir nel period impressionista. Milan, 1972: no. 371, repro. Monneret, Sophie (intro). Guida alla pittura di Renoir. Milan, 1980: no. 390. Walker, John. National Gallery of Art, Washington. Rev. ed. New York, 1984: 469, no. 683, color repro. European Paintings: An Illustrated Catalogue. National Gallery of Art, Washington, 1985: 336, repro.